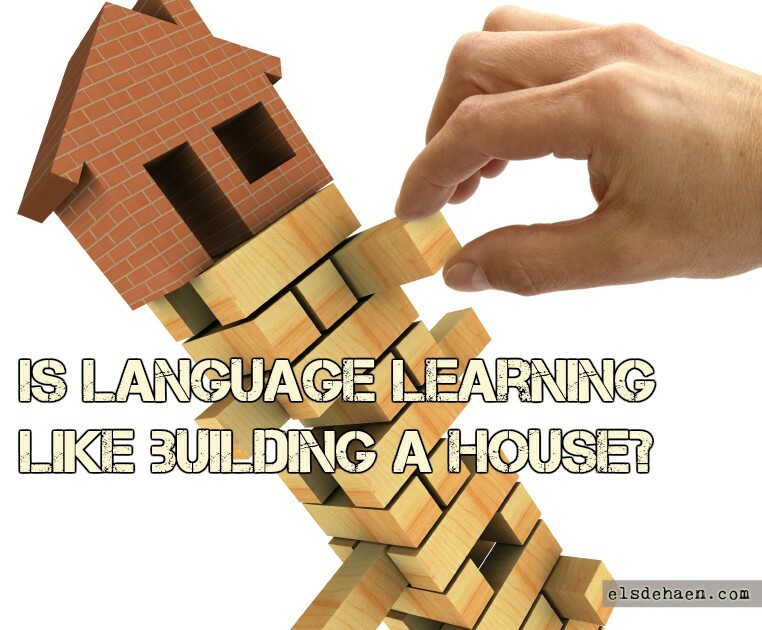 One of the metaphors I hear most often, is that language learning is like building a house. Your words are the bricks and the grammar is the mortar holding it all together nicely. Happy days in your little self-made language house. I don’t buy it. This would imply a number of things that are simply not true. Which things you ask? Allow me. If this were true, based on the hours many have studied Latin, a lot more people should speak it fluently. Yet, despite having a bachelor in Latin, I definitely don’t, nor do my more proficient classmates (one classmate made a cool Latin version of Bastille’s Pompeii though, I’ll give her that). To my knowledge, only this guy speaks Latin SO fluently him and his wife used to speak Latin when they didn’t want the children to overhear. (Am I the only one who now really wants to learn how to say things the children can’t hear in Latin?) To be able to use a language, you need to hear a language and you need to speak it. This is completely against the idea of ‘chunking’ where you pick up phrases or expressions in their entirety. Take the Dutch word ‘alstublieft’ (here you go/please). To fully understand this expression to the core, you need quite a bit of grammar. The expression is a shorthand for ‘als het u belieft’, which is a conditional sentences AND ‘belieft’ is a form of the rarely used verb ‘believen’ that is most often used in this exact construction. I think nobody would argue that you have to wait for the chapter on conditional sentences before you stop being a peasant and show some basic courtesy when you give or ask for something. Now you might argue that small, regularly used expressions that mean ‘please’ or ‘thank you’ lose their grammatical meaning and can simply be studied as words. Fair enough. There are more examples. Long before I could understand the grammar behind ‘we’re gonna go to a different room now’ in Japanese (as you can imagine, this was crucial information for me in Japanese class), I recognized the soundchunk of the teacher saying the phrase, combined with some gestures and everyone getting up and packing their bags. If you had asked me to repeat the sentence, I wouldn’t have had the foggiest idea where to begin, yet the teacher and I had communicated successfully in Japanese. 3. Once your foundation is alright, it’s rock solid! If you’re really adamant about comparing language learning with building something, I’d suggest seeing it as an intricate game of Jenga where every so often a bit of knowledge gets pushed out and you have to give it a new place on top while you make sure your whole language tower doesn’t come crumbling down. At some point I’ll grow up and get bored of lame puns and/or memes. Today is not that day. An example: as a kid you try to make sense of the things people around you are saying. You might pick up words like ‘made’ or ‘ate’ or ‘did’ because you hear them so often. Then, at a later stage of your language acquisition, you learned a cool new trick: when you talk about something that happened before, you simply add -ed to the verb (watched, learned, wanted, etc.). Easy as pie! Yet, all of a sudden the adults around you start correcting you because you say ‘maded’, ‘eated’ and ‘doed’ instead of the correct versions above. You succesfully learned a new rule, but you now have to re-learn the exceptions. Especially to adults trying to learn English, ‘maded’ seems like a step backwards. So is it really not like building a house… at all? All in all, I’m not big fan of comparing language learning with building a house. However, I’m all in favour of comparing language teaching with building a wall. It’s never a bad idea to build a wall of knowledge to protect yourself from the strong, biting winds of incomprehensible language coming at you fiercely (Japanese, I’m looking at you!). Don’t overdo it though. All work and no play… In the words of a wise colleague of mine: playing scales will undoubtedly improve your guitar skills, but the best teachers let their students go home with a song that plays in their heads for days. And yet, …. houses come in different shapes, materials and sizes. They vary across cultures. Builders vary too … Manufacturing bricks and mortar is already a complex process of mining, selecting, weighing, mixing, moulding … All are important skills, and so is ‘constructing’ . Years ago I watched my neighbours’ house being built. 3 men took part in the activity: one applied the mortar, the other put a brick on top and the third wedged it firmly in position. At the end of the day they had finished 3 rows. I noticed the rows were not level. The next day the architect came. He made the builders take down two rows, and some bits and pieces here and there … It took them quite a while to finish the house but towards the end they progressed faster and the quality of their work improved. The architect only showed up once a week, if at all. Now it is a beautiful and functional place. And yet, the neighbours have just decided to add a conservatory. They also had an interior decorator over . Repainted, their living room looks twice its former size. Building a house is never finished. There’s always some area that can do with some revamping for aesthetic or structural reasons…. . And building a house is not like learning a language you say? . And oh, I forgot to mention that they are planning a pop-down-for-the-weekend cottage in the North of France…. You’re amazing. I’d love to read your stuff. Can I interest you in a guest post 🙂 ?